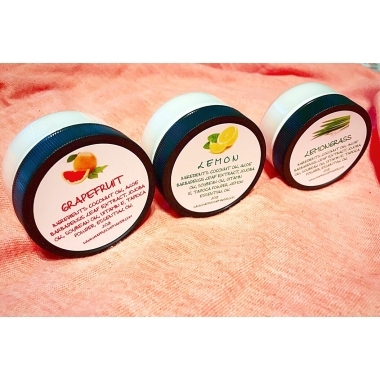 Try this wonderful set of of natural whipped body butters (2 oz jars) with luxury Jojoba OIl, scented with citrus Essential oils: Lemon, Grapefruit and Lemongrass. It would be wonderful mini gifts for Christmas, Mother's Day, Teacher Appreciation Day, Birthday Jojoba oil is an odorless, golden liquid wax that is produced from the seeds of the jojoba plant. Jojoba oil is very similar to sebum – the natural oil that lubricates your skin. Jojoba contains nutrients like vitamin E and B, as well as minerals like chromium, copper, and zinc, which all nourish and protect skin from environmental stressors. Soybean Oil contains high concentrations of genistein, vitamin E, essential fatty acids (EFAs), and lecithin. Essential fatty acids help moisturize the collagen below the skin surface while lecithin maintains the elasticity of the skin, smoothing fine lines and preventing premature aging. Coconut oil is a great skin softener and helps you do away with dry and hard skin conditions. Has a high moisture retaining capacity so it acts as an excellent moisturizer for your skin. Contains mostly fats, so it acts as an emollient providing a softening and soothing effect. Absolutely NO HARSH CHEMICALS - No petroleum - No Parabens - No preservatives. How to use: It’s best to rub in a light layer of the body butter just after a hot shower while the pores of your skin are still open. It may feel a little greasy just after application, but within minutes it will soak into your skin. The result is soft and glowing skin (not greasy!). Remember that body butter is thick and luscious. A little bit goes a long way!